Borussia Dortmund fans burned his shirts and called him “Judas,” but now Mario Götze is back after three years with Bayern Munich. 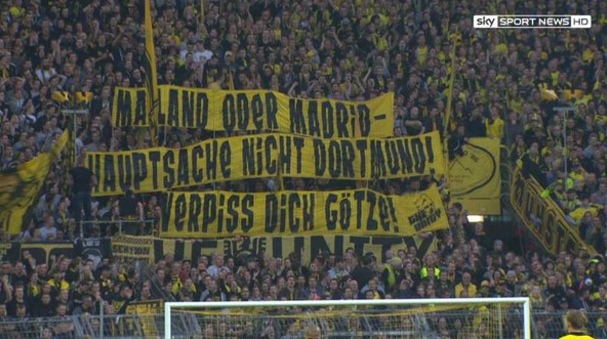 Back in April, when rumors of a potential return first surfaced, Dortmund fans held up banners that read “Milan or Madrid. Just not Dortmund. Piss off Götze!” during a match against Werder Bremen. So with that sustained distaste on the record, Götze couldn’t just waltz back into the club and act like nothing ever happened after his chances with Bayern dried up. He tried to soften the news with a Facebook message. Götze, a product of the Dortmund academy, said in a statement on Facebook that his decision to leave Dortmund in 2013 was one he regrets. “Today, three years later and at 24, I look at that decision in a different light,” he said. At least one person at Dortmund is happy to have him back, though.